Just when you thought you’d need only your cell phone to shoot video, Sony introduces two new ideas that may change the game a bit: a gyro-stablized lens and a built-in projector. 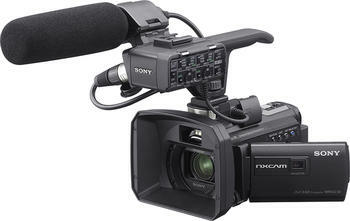 Have a look at the new, remarkably small Sony HXR-NX30, a $2,000 camcorder just arrived from the future. Weighing about two pounds and stretching to a foot with battery attached, this small HD camcorder solves a constant problem for journalists and other hand-held videographers: the gyro system is, essentially, a built-in Steadycam-like feature. Without the extended balance mechanisms. Small enough to tuck into a medium-sized shoulder bag. The built-in project is fairly modest, more useful for screening the days’ work on a hotel wall than for a public screening. Still, the projected images can be as large as about three feet (diagonally), and if they aren’t beautiful HD quality, they are far, far better than the images you’d be watching on the built-in 3-inch LCD screen. Although the results are suitable for professional purposes, this is, in essence, a prosumer camcorder. It’s nice to see nearly 100GB of built-in memory (which goes quickly when shooting in HD), and it uses SD cards. There are XLR connectors for professional microphones, and a decent amount of control for just about every application. And there are a gaggle of other useful features, all common in this price category. The news here is the built-in stabilization. Many will purchase this camera for that feature alone. And, hopefully, we’ll see lots of cameras with a similar feature–it should become standard in two or three years.